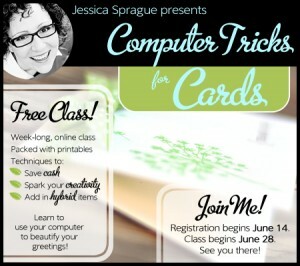 Take a free Computer Tricks for Cards online class courtesy of JessicaSprague.com. Registration starts today and continues until the class starts on June 28. To register, fill out the form and enter the access code JSCTcardsFree2010. The free online class runs from June 28 through July 4 and will teach you money-saving techniques to help you create unique, attractive greeting cards using your computer. The class is self-paced and you should have access to it after the week is over – so don’t let a busy week stop you from signing up. For those of you who don’t know, Jessica Sprague has been a contributing editor to Creating Keepsakes magazine. She is a hybrid scrapbooker – meaning she often combines digital and paper scrapbooking. I’ve taken a few of her online courses and they are wonderful! I highly recommend signing up for this one, too! If you’re interested in digital scrapbooking and creating projects with your computer, be sure to check out the other free downloads and tutorials she has on her site.